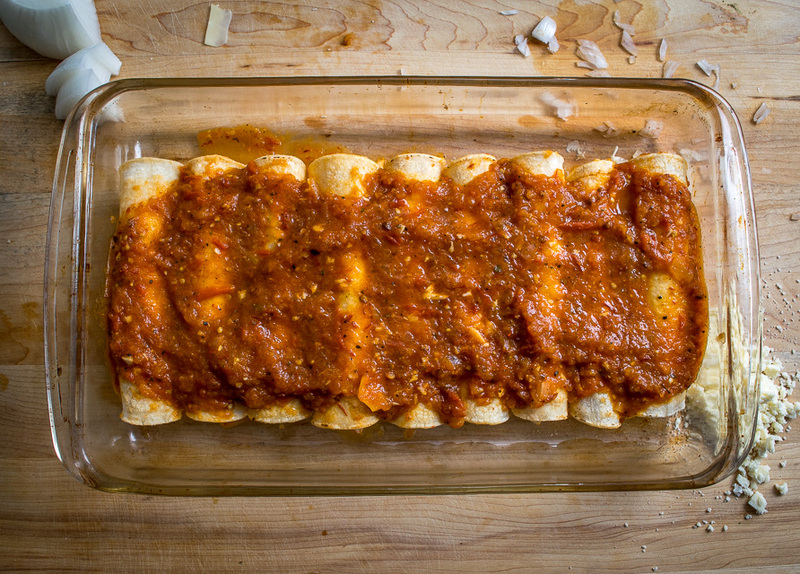 This is my go-to recipe for red sauce enchiladas. Fast, incredible flavor, and stress free to make. Sound too good to be true? Don’t let the simple ingredient list deceive you. The combo of roasted tomatoes, cumin, and chipotles in adobo creates a where-have-you-been-all-my-life flavor that is far superior to anything you can get at your local Mexican joints. This is Recipe #4 of our free Mexican Cooking guide that details 27 droolworthy Mexican recipes you can make from a simple, inexpensive pantry list. Click here to read it or go to the Survival Guide tab at the top of this page. Let me know what you think! First things first. If you have enchilada sauce in a can somewhere in your pantry, start by placing that can at the very bottom of the nearest trash receptacle. 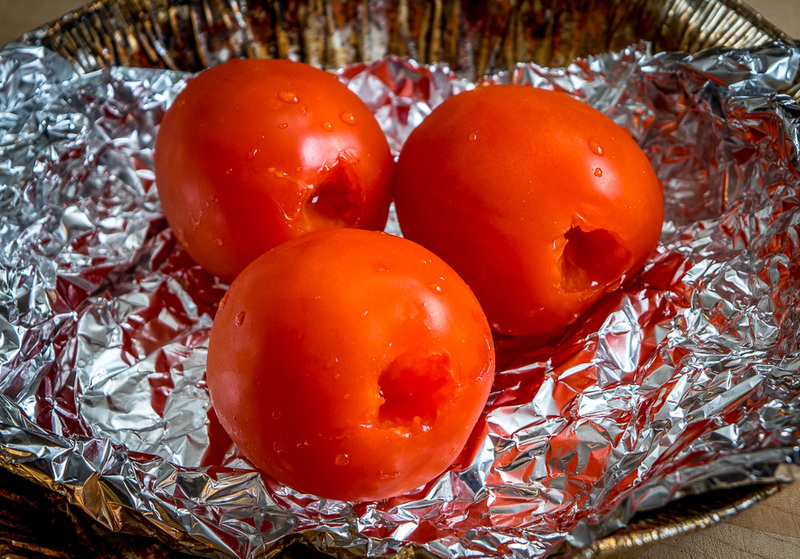 Then get three tomatoes roasting in the oven at 400F. And saute 1/2 an onion and 3 garlic cloves in a dollop of oil. You can chop roughly as all of this is going in the blender eventually. You’ve got options for the chicken. Rotisserie chicken will work if you want to streamline this recipe even further, or you can poach a chicken breast for 15-20 minutes in simmering water. That’s what I did for this batch. Okay, in about 10-15 minutes the tomatoes will be roasted ‘enough’. Add them to the onions along with 3 chipotles in adobo, 1 Tablespoon adobo sauce, 1/2 teaspoon cumin, 1/2 teaspoon salt, 1/2 teaspoon Mexican oregano, 1 cup stock, and some freshly ground pepper. If you’re new to chipotles in adobo you can find them in the Latin goods section of most grocery stores. 1-2 Tablespoons of chili powder would be a viable substitute for the chipotles in adobo, but I think it’s worth it to keep a few cans of the chipotles in adobo on hand for recipes like this one. They create a rich, complex flavor that is hard to duplicate. After the mixture comes to a uniform temp (2-3 minutes), add it to a blender and combine well. Return to saucepan and simmer on mediumish heat. Take a taste for seasoning. For this batch I added another pinch of salt and another pinch of oregano. Also note that using 3 chipotles in adobo creates some real heat. If you want a less spicy dish you can dial back and use only 1 or 2 chipotles. After warming up the tortillas (I used the oven for a couple minutes), add a dollop of the enchilada sauce to a plate. Dredge a tortilla in it and flip. This ensures you have some of the delish sauce inside each enchilada. Fill with chicken, cheese, and a few bits of raw onion. Roll tight and place on a baking dish. You can line the bottom of the baking dish with some enchilada sauce to prevent sticking if you want. Cover the enchiladas with the remaining sauce and give ’em a jiggle so the sauce seeps in between them. Bake at 400F for 8-10 minutes, or until you can’t wait anymore. Mexican Rice and a basic Guacamole also work really well with the flavor of this dish. 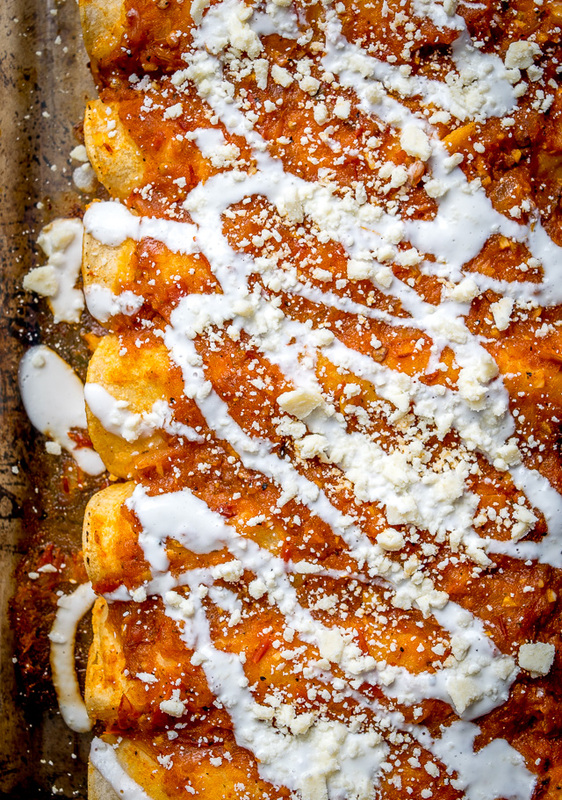 Please oh please give these Red Sauce Enchiladas a try if you’ve never made your own enchilada sauce before. By keeping just a few ingredients on hand you’ll always have the option of eating the best Mexican food in town in less than 30 minutes. 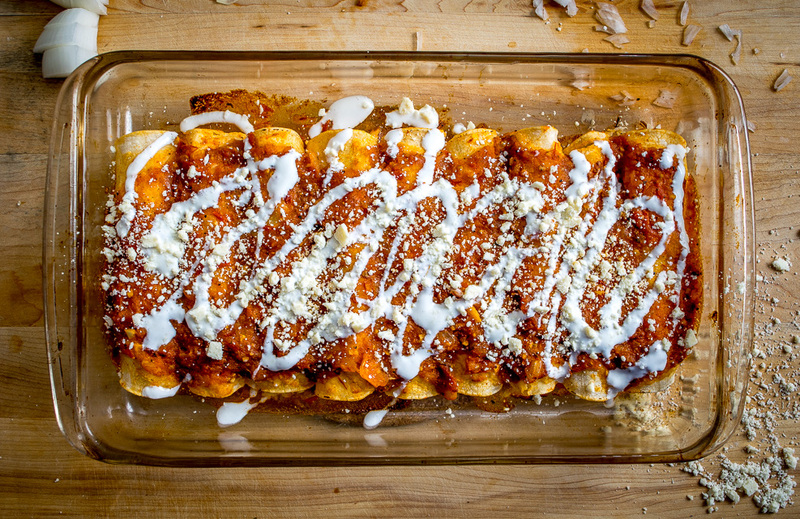 This is my go-to recipe for red sauce enchiladas. Fast, incredible flavor, and stress free to make. You might even have all the ingredients on hand already. 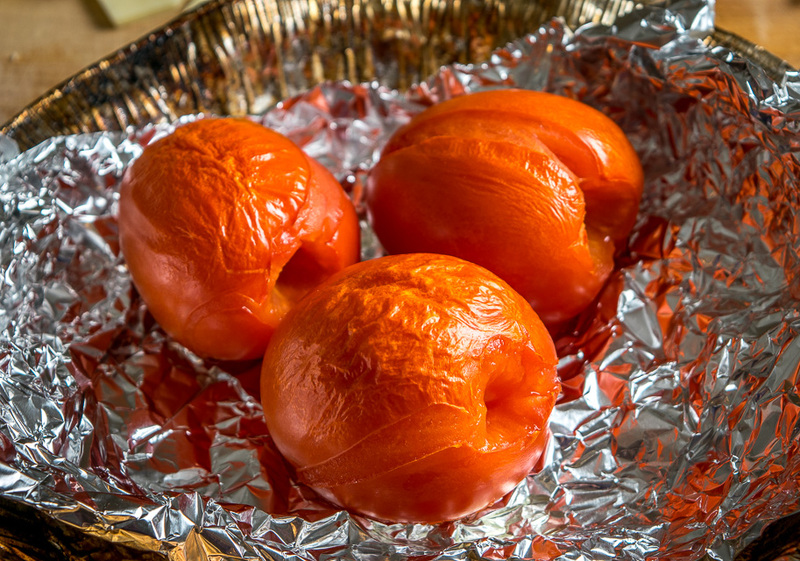 Start by roasting 3 tomatoes in the oven at 400F. If you are poaching the chicken, cover the chicken breast with cold water in a saucepan and bring to a boil. Reduce heat to a simmer and let cook until the chicken is no longer pink inside, approx. 20 minutes. 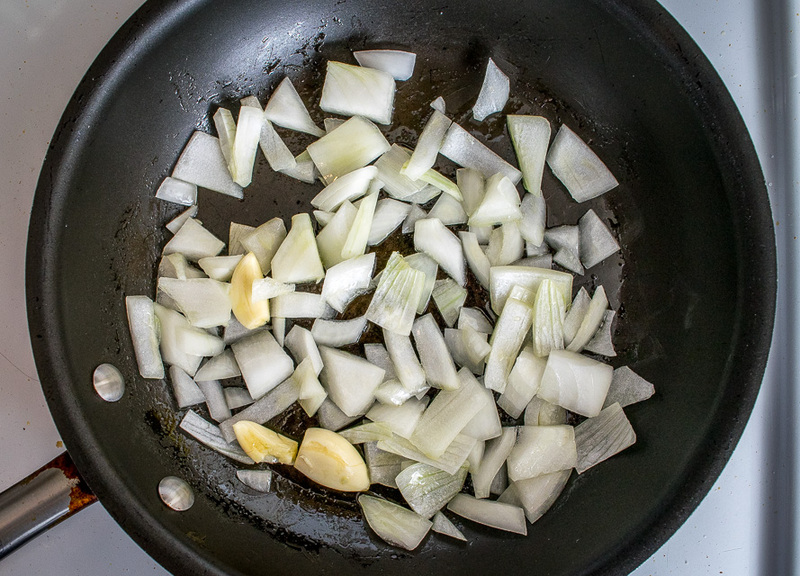 You can also add salt, onion, and cilantro to the simmering water for a hint of additional flavor. Once cooked, set aside to cool and then shred using two forks. Saute a roughly chopped 1/2 onion and 3 whole, peeled garlic cloves in a dollop of oil over medium heat. 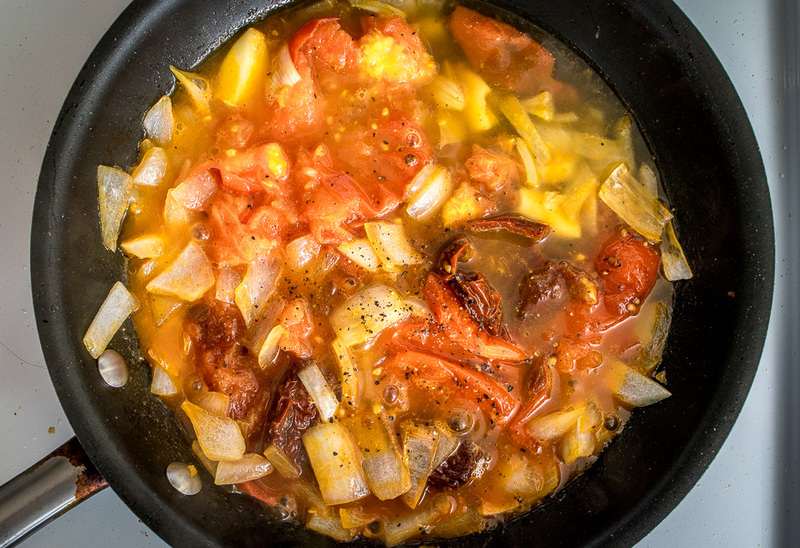 Add the roasted tomatoes to the onions and garlic, along with 3 chipotles in adobo, 1 Tablespoon adobo sauce, 1/2 teaspoon cumin, 1/2 teaspoon Mexican oregano, 1 cup stock (or water), 1/2 teaspoon salt, and freshly ground black pepper. Let the mixture simmer for a few minutes and then add it to a blender. Blend well and return to the saucepan. Taste for seasoning. ( I added additional pinches of salt and oregano to this batch). Let simmer for 5-10 minutes on mediumish heat. Meanwhile, heat up 8-10 corn tortillas. I covered them with damp paper towels and nuked them for 60 seconds. 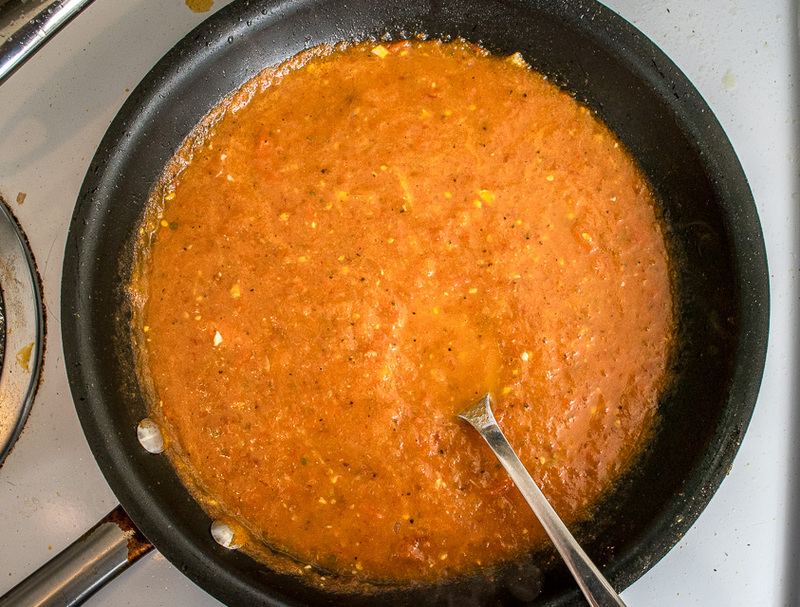 Add a dollop of the enchilada sauce to a plate. 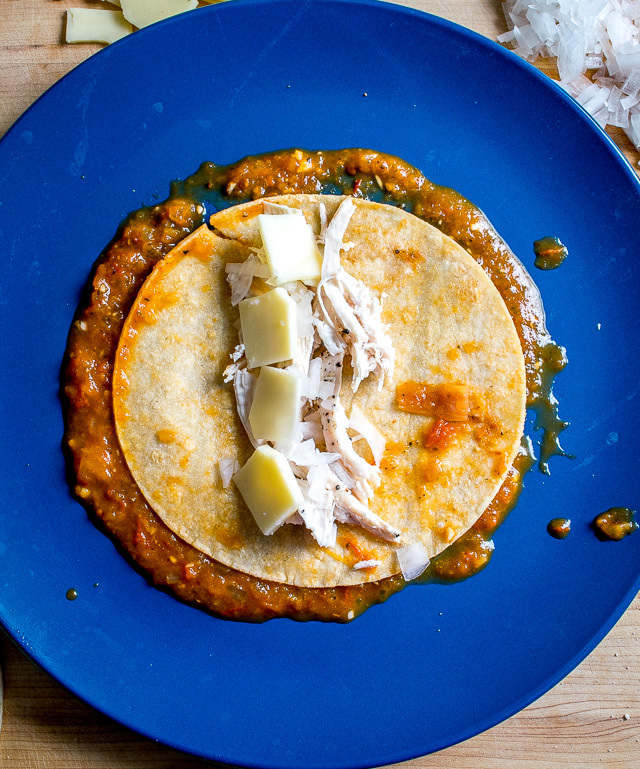 Dredge a tortilla in the sauce and flip. Fill with shredded chicken, chunks of cheese, and some bits of finely chopped raw onion. Roll tight and place on a baking dish seam side down. You can line the baking dish with enchilada sauce to prevent sticking. Continue rolling the enchiladas until all the chicken is gone. A single chicken breast will make 7-9 enchiladas. Cover the enchiladas with the remaining sauce and give them a jiggle. 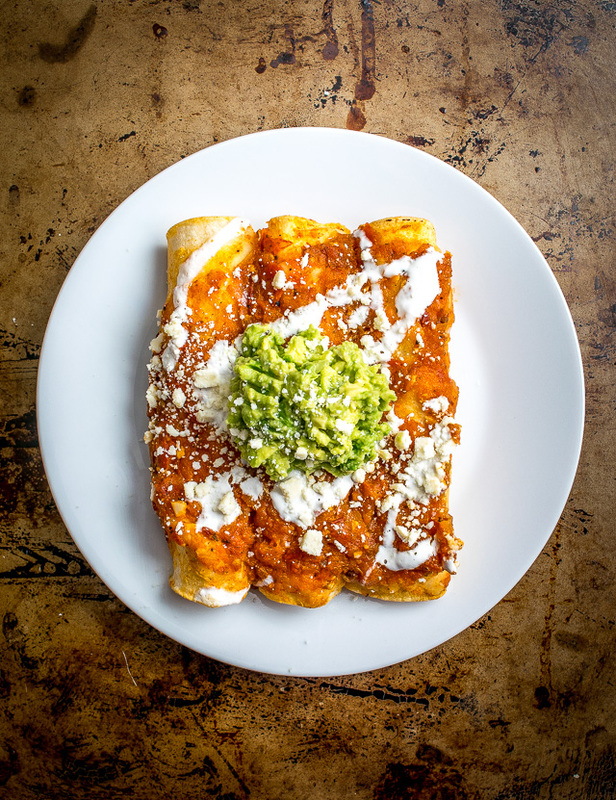 Serve immediately with your choice of Crema, Cotija cheese, Arroz Rojo, and Guacamole. Mexican oregano works really well in this dish so use that if you have some, but you will still get a great result without it. I used a homemade chicken stock but virtually any stock (or even water) would work for this dish. Be sure to warm up the tortillas before building the enchiladas. This makes them easier to roll. P.S. 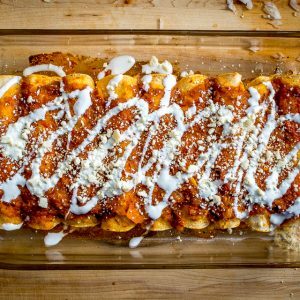 Once you are comfortable making enchiladas in this style you can swap out some ingredients to make our Colorado Enchiladas and Enchiladas Suizas. 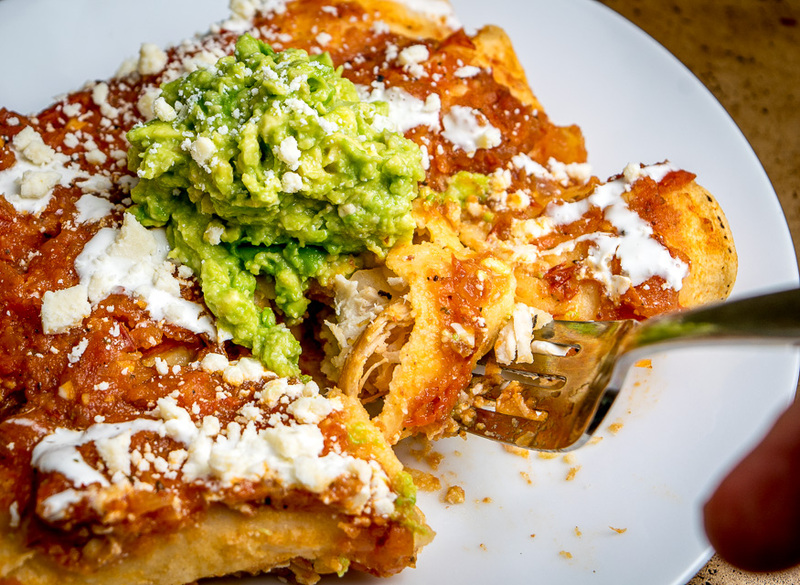 Enchiladas are one of my family’s dinner favorites, and these just might be the ones that get served up next! Simple, delicious and dressed just right. These are sure to be a hit! Patrick, I hope you respond to this. I made the enchiladas last night. To rave reviews. Today, I noticed I had some of the sauce on one of my cupboard handles. Because it’s below the kitchen island where I assembled the enchiladas. Lazily, I just wiped it off with a paper towel. That one little portion I wiped off turned my old copper handle from black to shiny new copper. Oh my gosh. Have I discovered the best way to clean copper with no effort? Is it the chilpote? Ha! New hit product: Diana’s Copper Cleaner (with secret ingredient!). P.S. Thanks for the feedback on the enchiladas, glad you guys liked them. I thought I stumbled on a great discovery. Like when Fleming accidentally discovered penicillin. Oh well, no Noble prize for me. Oh my word. How have I not known about your site sooner?! This recipe looks incredible. The canned enchilada sauce is sooooo spicy, will definitely give this recipe a trym. With only one or half of a Chipotle lol. Hi Neyssa! Thanks for stopping by. Making this currently! I subbed: 1 can diced tomatoes for the fresh roasted ones….2 Tbls chili powder for the canned chipotles in adobo…two long stems fresh oregano from the garden, then removed after about 10 minutes of simmering..Letting it cool now…will blend when cooled and then assemble and bake for dinner OH! Also, I just baked chicken thighs with lots of cumin little bit of chili powder and salt….My kiddos don’t care for white meat 🙂 THANK you for posting this! 1st time attempting homemade enchilada sauce!!! Husband is excited! Awesome, thanks for the update Sharil, I hope the fam liked it!! P.S. Chipotles in adobo want to be in your kitchen. Give ’em a shot! Soooo good! Used queso fresco in and on top, after they came out of the oven. They were spicy and delicious! Just what these ex-Texans needed! Awesome, thanks for your notes Leah! So glad they worked out for you. It’s been a couple months since I’ve had these, but your reminder will prob push them into this week’s menu! Recipe was quick but most importantly delicious. I recommend the crema as mentioned. I didn’t change anything in the recipe. Thank you! Thanks for the feedback Ariel! Glad you found a keeper recipe on the site. Cheers. Have made enchiladas for the longest but this recipe was without a doubt, one of the best!! Spicy but with the crema fresca and queso fresco, excellent balamce. Thank you! Thanks for the feedback Gillian! I luv the flavor in that red sauce too. Cheers. This was another game-changer for me. It was the second of yours I have tried. OUr next family trip is bound to be to Mexico, soley to eat the food! Absolutely delicious. I will forever rave about this recipe! My husband and sons were thoroughly impressed as well. Thank you for sharing it. I can’t believe it took me so long to find this site! It is forever bookmarked! Thanks Meg, glad the fam liked it! Living in Germany and having never made enchiladas, I was curious to find if I could make this work. I was delightfully surprised how easy and delicious the red sauce was to create. Can’t wait to try out your cilantro and lime rice along with others recipes on your blog. Thanks for sharing, Ole’! Hey thanks for your note Deb! I love the idea of peeps halfway around the world having success with these recipes! Cheers. Thanks Chi, so glad the enchiladas were a hit! Yeah I’ve been getting lots of emails from Australia lately — seems like authentic Mexican is rare there, which means lots of business potential! !